"Hello all! 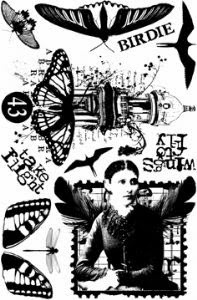 For my second Ink & the Dog project of the week, I’ve switched from Dolls to Wings, but the Dolls will be back tomorrow - and I’ve just realised they do play a part in this creation too. For this I used one of the lovely chunky canvases, the 6x6 size, and I’m back in the neutral zone". 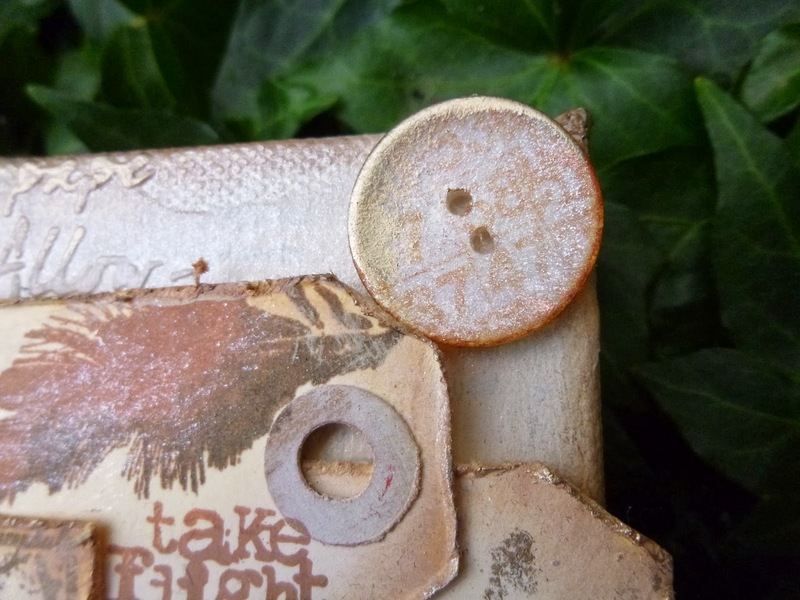 I pretty much started with the embellishments for this one... I’d been meaning for ages to create some stamped buttons, and that was the trigger point. I stamped some images from the Dolls plates onto tissue paper. There’s the lovely script from Dolls 2, the body of the male Doll from Dolls 1, and the postmark from Dolls 4. 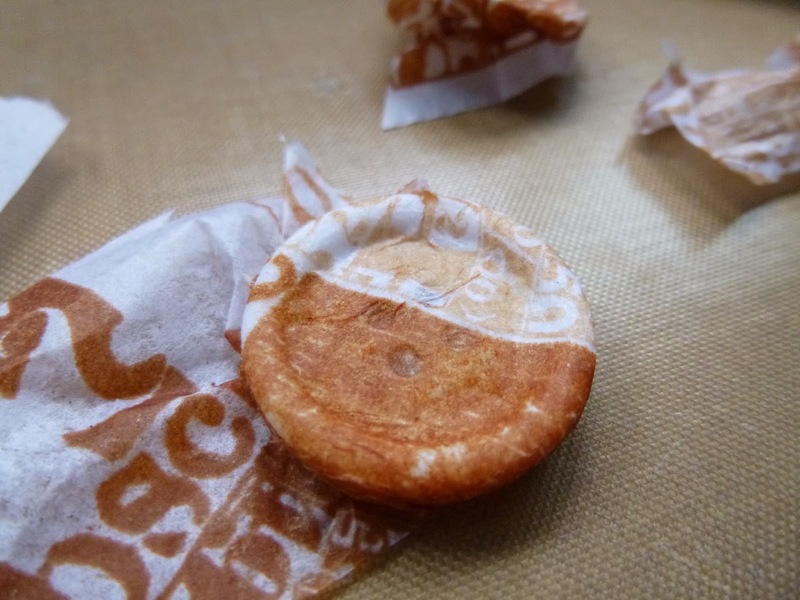 Then I spread slow-drying multi medium onto the tissue paper and carefully moulded it over the buttons, pressing down into the ridges. If your stamping is too dark to see the buttonholes properly, hold the button up to the light so that you can pierce through with something (I used an Idea-ology Memo Pin - I always have one lying around to clear my glue nozzles!). 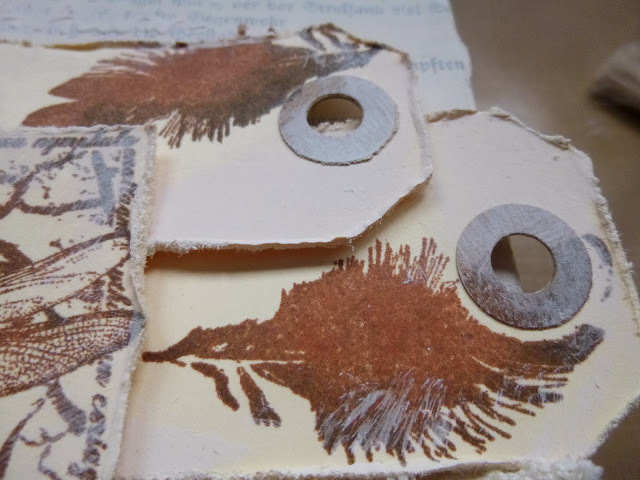 I waited until the glue had dried and then used a sanding block to gently sand away the extra tissue paper from the back of the buttons. So we have a nice collection of buttons awaiting somewhere to live... At this point, I still vaguely had my original project in mind (as mentioned yesterday), but when that fell through, I had to find them a new home. Time to get going with the canvas, therefore. 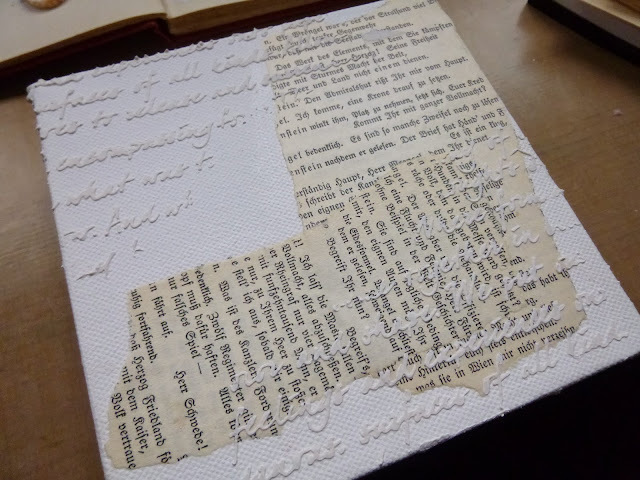 I started by pasting some book pages on with multi-medium, and then used the Mini Art Is stencil to apply some Grunge Paste through. 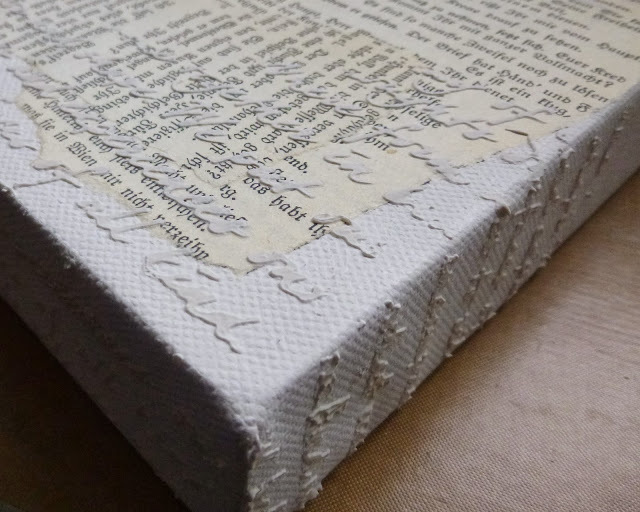 These canvases are so fabulously chunky - definitely an invitation to take the Grunge Paste texture into three dimensions. 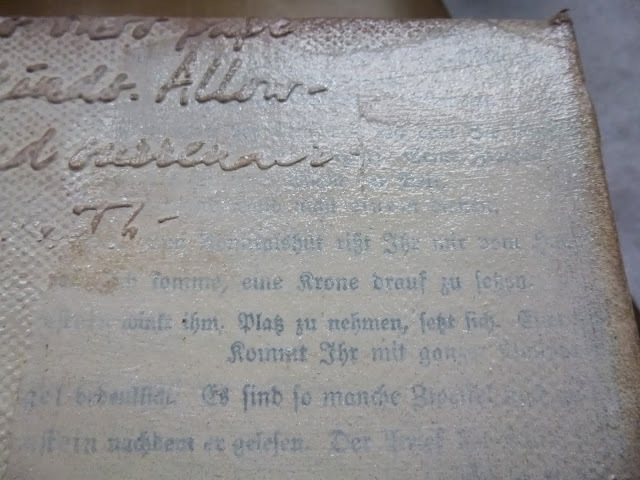 I already love how the Grunge Paste script looks against the book text. 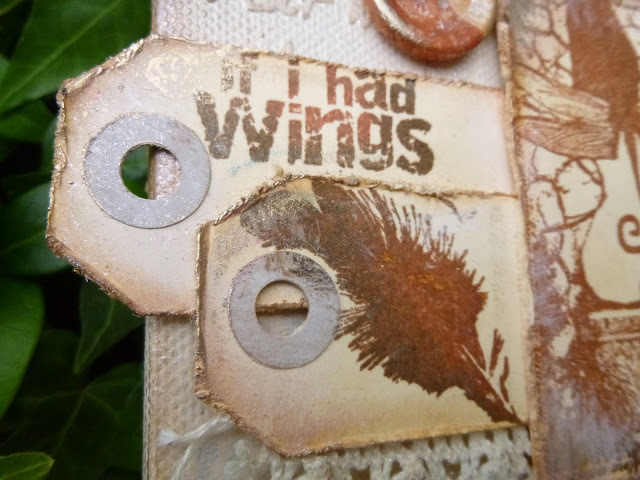 I really enjoyed playing with the mini tags for yesterday’s journal pages, so I grabbed some of them again, and stamped the beautiful feather from Wings 2 onto them. 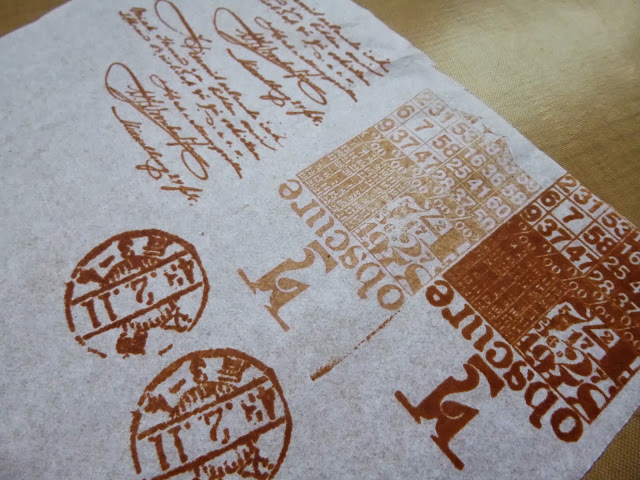 I first applied Sepia Archival ink to the whole stamp, and then added Potting Soil to one edge. I love this two-tone (or more!) 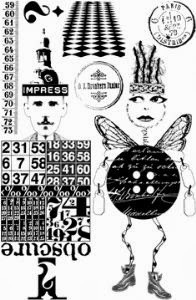 stamping... it gives a lovely depth to images, I think. 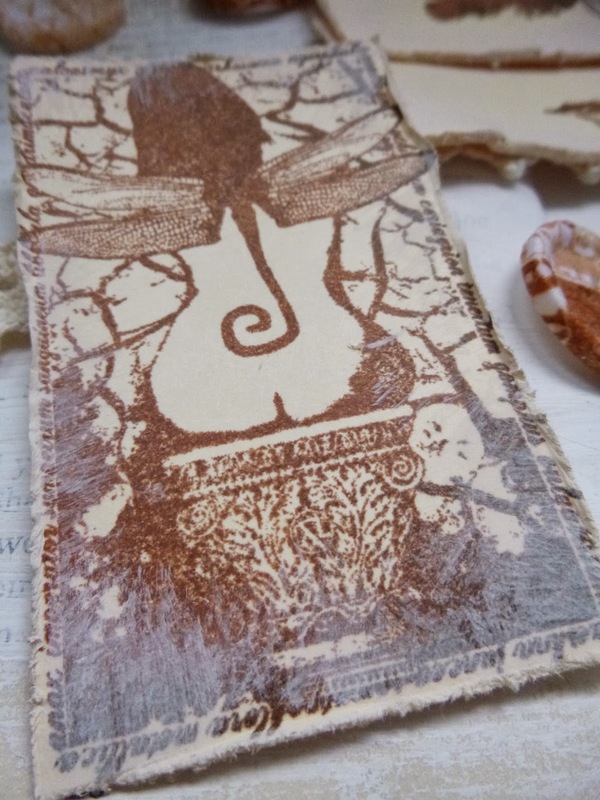 I stamped the wonderful winged cello woman from the Wings 3 plate onto a larger tag, and cut her out. 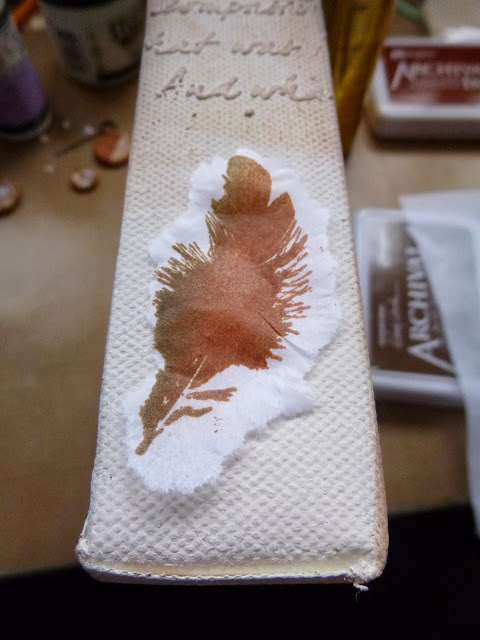 At this point, I had to already be playing with the layout, so that I would know where to stamp on the tags, and which direction I wanted the feathers to go in. And playing around allowed me to see that I could add the quote from Wings 2 to one of the tags too. 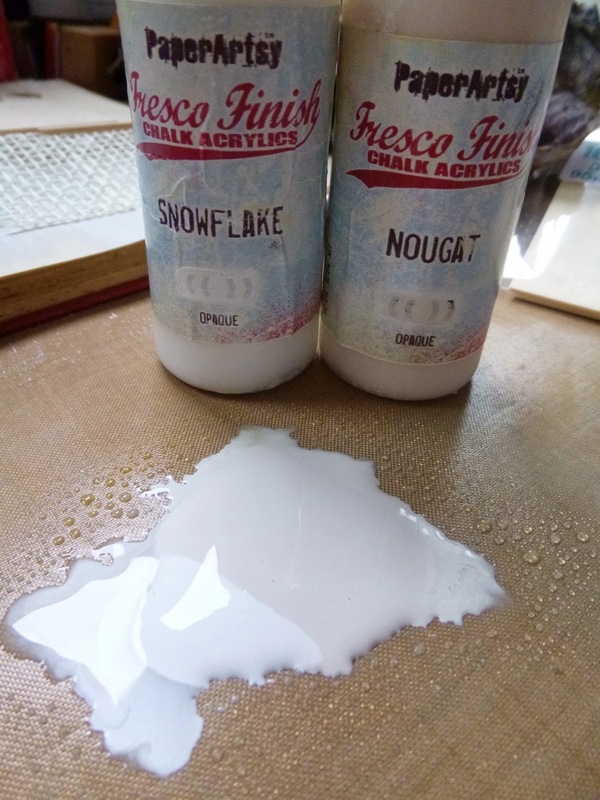 Once the layout was halfway ready, I took it all off and gave the whole thing a wash of paint using a blend of Snowflake and Nougat, spritzed with water on the craft mat to dilute it. This softens and blends all the elements. 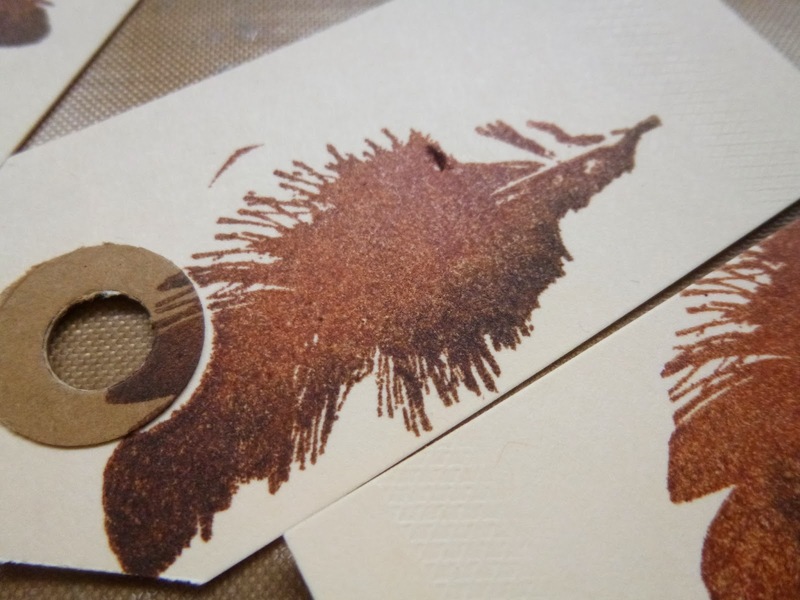 ... as well as to the feather tags, so that they would look like part of the same creation. I then started dry-brushing layers of colour onto the script to give it some definition - Mud Splat, and then Cinnamon, if memory serves. Another little play with the layout... You’ll see the lace has been cut in half and changed position, and I’ve also added some more words to one of the other tags. 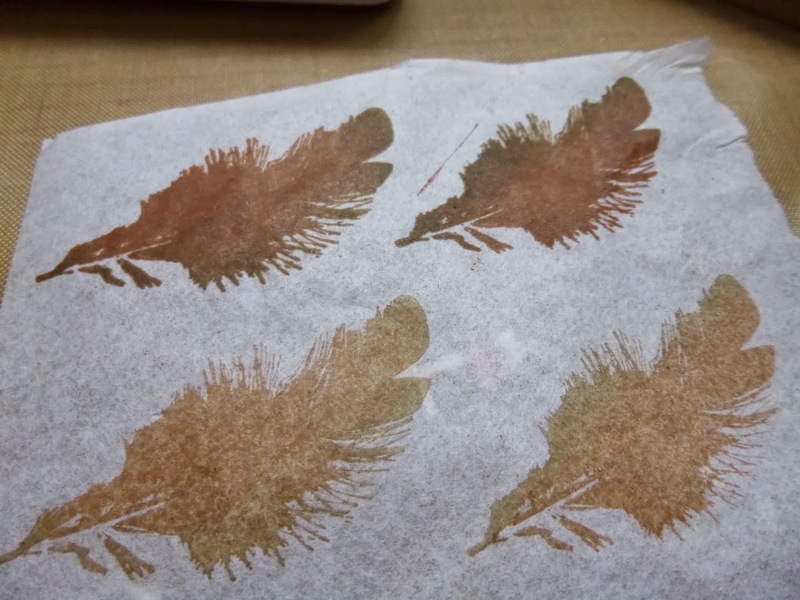 More tissue paper stamping next... With such chunky sides to my canvas, there was room to add the beautiful feathers to the edges too. 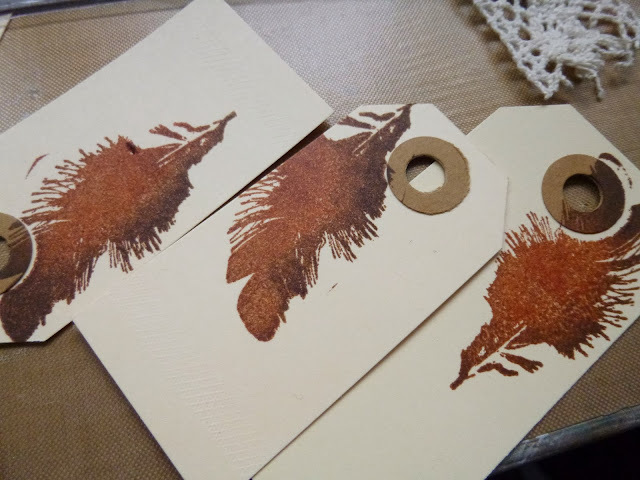 I stamped them, still using the blended ink colours, onto some white tissue paper. Using the slow drying matte multi medium again, I carefully adhered the feather to the canvas, and then used my fingers to gently apply more medium over the top of the image. 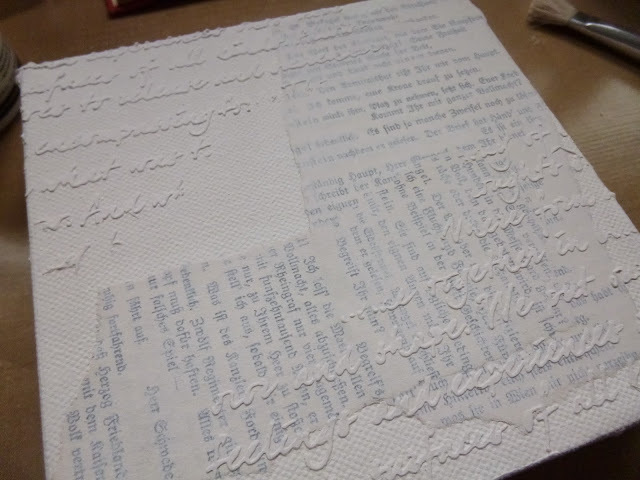 I gently tapped a paintbrush upright around the edges, using the bristles to really work the tissue paper down into the texture of the canvas, so that it would be less visible once dry. 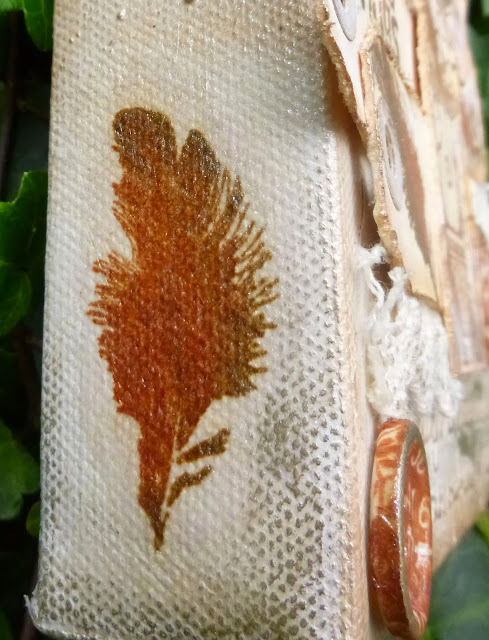 At the other side of the canvas, the space for the image was at the top corner, so I adhered the feather the other way up there. The next step was one of those “oh, well, why not give it a go?” moments. I wanted to see what the Metallic Glaze would do for the project. I’d never used it, but liked the sound of it! 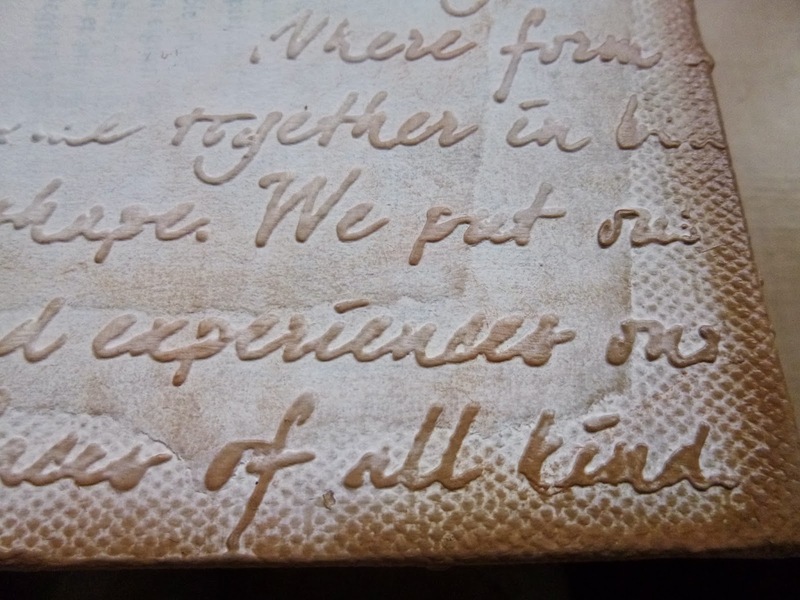 I was even sensible enough to try it out first in the centre of the canvas, where it would be covered by several layers of tags if I decided I didn’t like it. 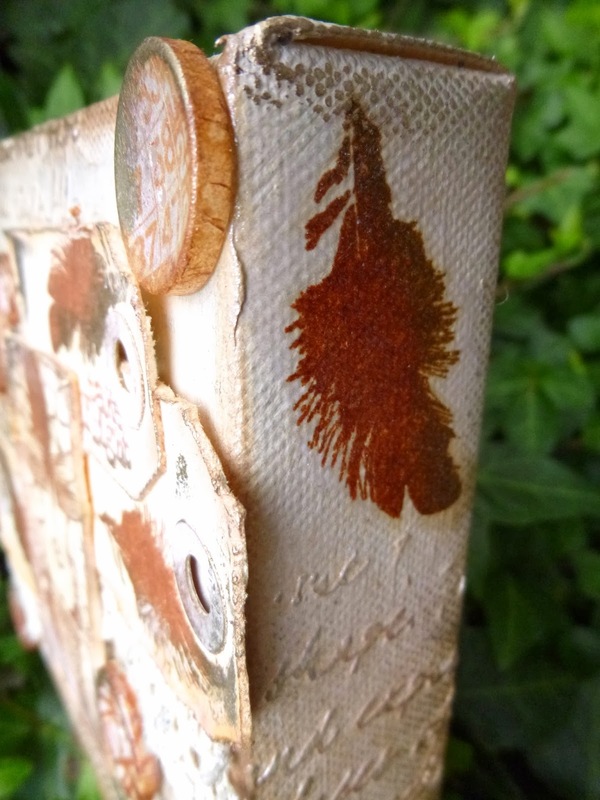 No such thing - I love the shimmery beauty of it, so I covered the whole canvas with it. And having started with metallic shimmers, I couldn’t resist going a step further, so I cracked open the Treasure Gold. I started out with some bold choices - trying out Rose Quartz, Aquamarine and Sapphire before I finally came back to my favourite White Fire - so in places you can see layers of gilded colour! And of course the buttons had to be treated too ... They’d already had a little inking around the edges with Vintage Photo Distress Ink. So then I added an all-over coat of Metallic Glaze, and a sweep of White Fire along the top left edges of each of them, so it looks as though that’s where the light is falling. 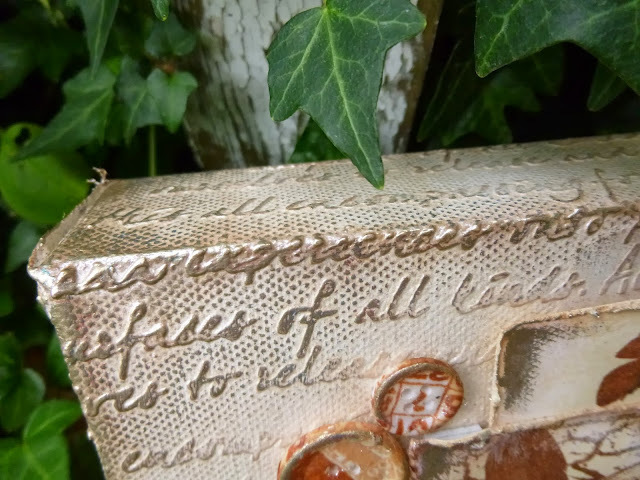 So there’s my neutral, shimmery canvas, with wings of tags and lots of gilding. 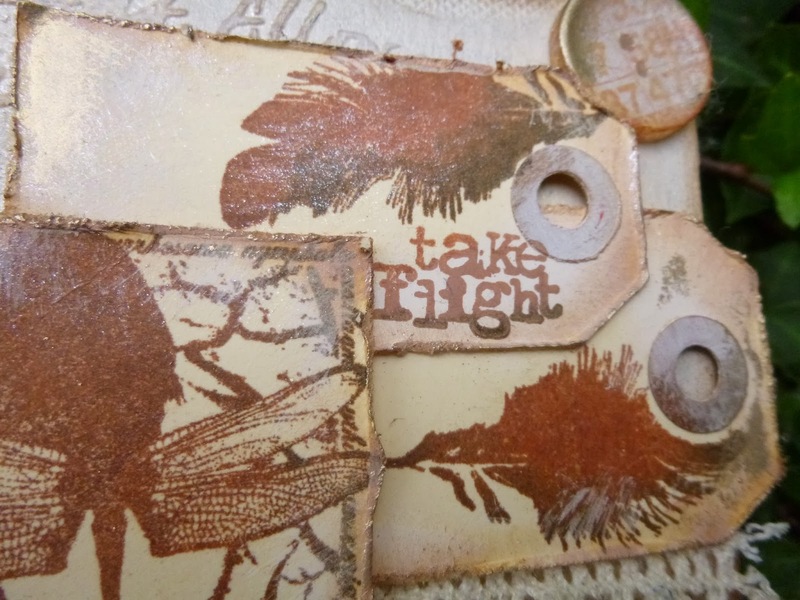 I hope it will offer your creative imagination wings - can’t wait to see how you take flight! See you tomorrow for one final, very crazy project from me for this month. Leandra Says: Really nice to see the full composition process you employ as you work through making decisions Alison! I really struggle to stick to such a neutral colour palette, but following this makes it so achievable! 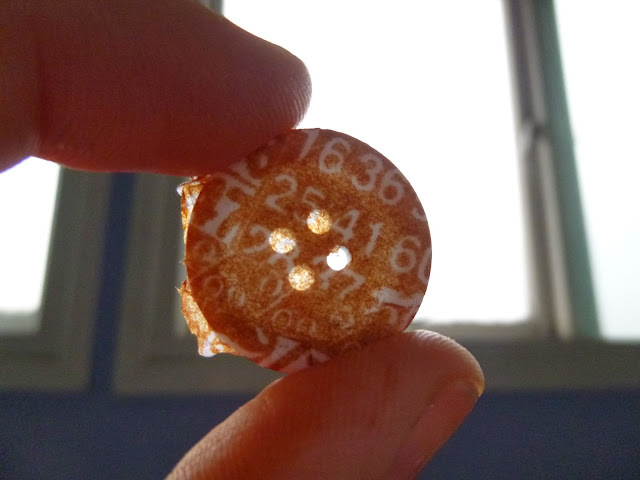 The buttons are too cool! Gillian Says: Love Love Love this colour palette and the composition is just gorgeous. Really like the effect from adding Metallic Glaze. 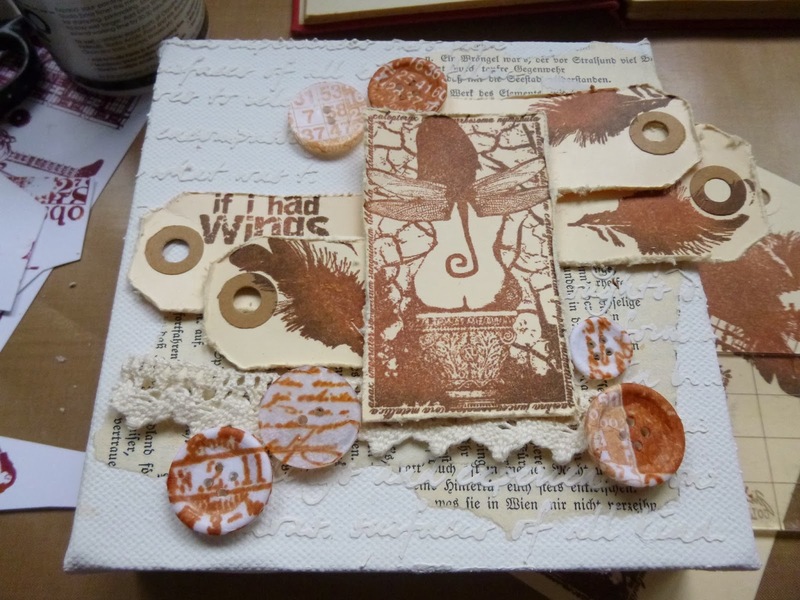 Beautiful project again Alison - love the step by step pictures with such detail. Gorgeous!! Absolutely gorgeous and brilliant all in one! I love every bit of it. Bravo! love that Alison - particularly the balance of the whole project across the canvas. 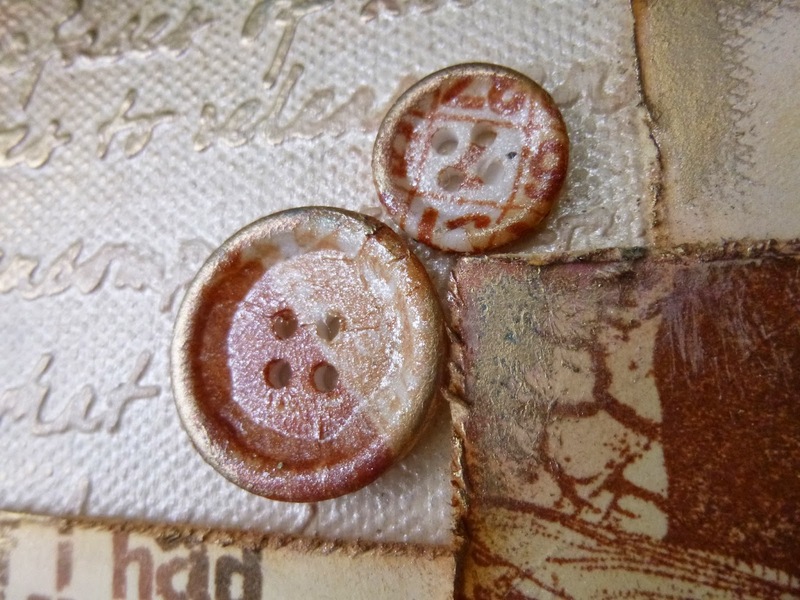 I am filing the button-tissue idea for a rainy day... maybe this week even! Wonderful canvas. 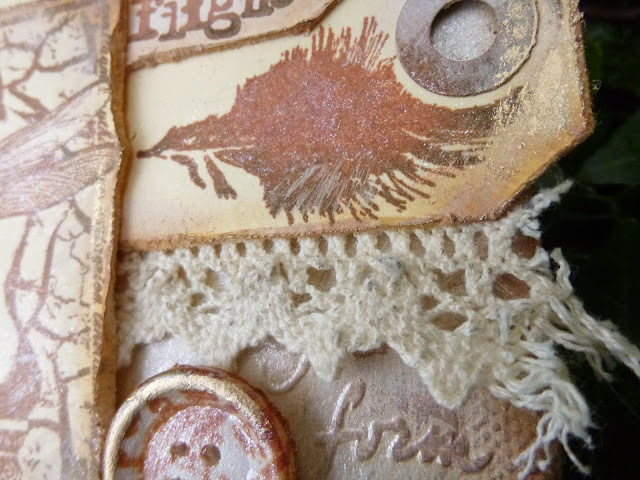 Love how you've been using tags as embellishments and for texture, Alison. Superb! Wow! 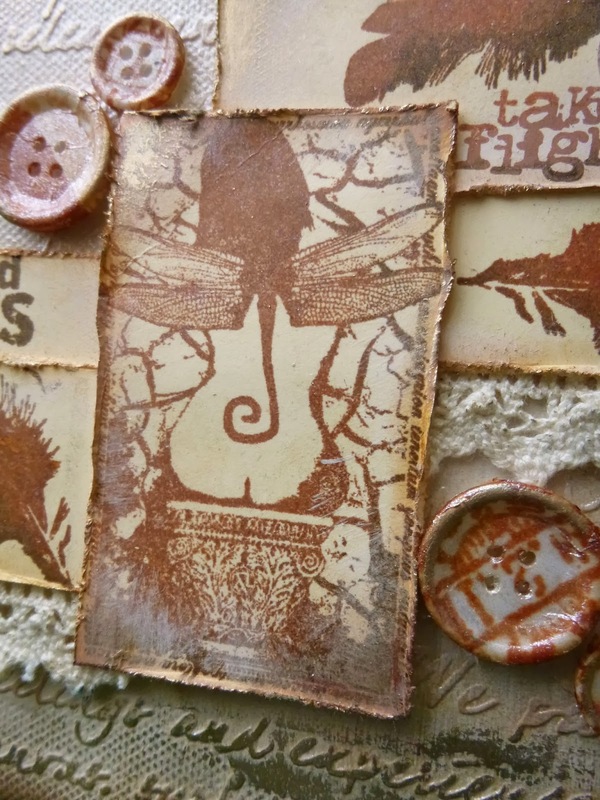 This is a stunning project Alison! 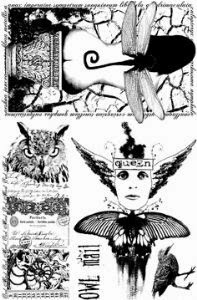 The winged woman is one of my all time favourites. Wow! That is very, very beautiful. So, so gorgeous!! Love it!! 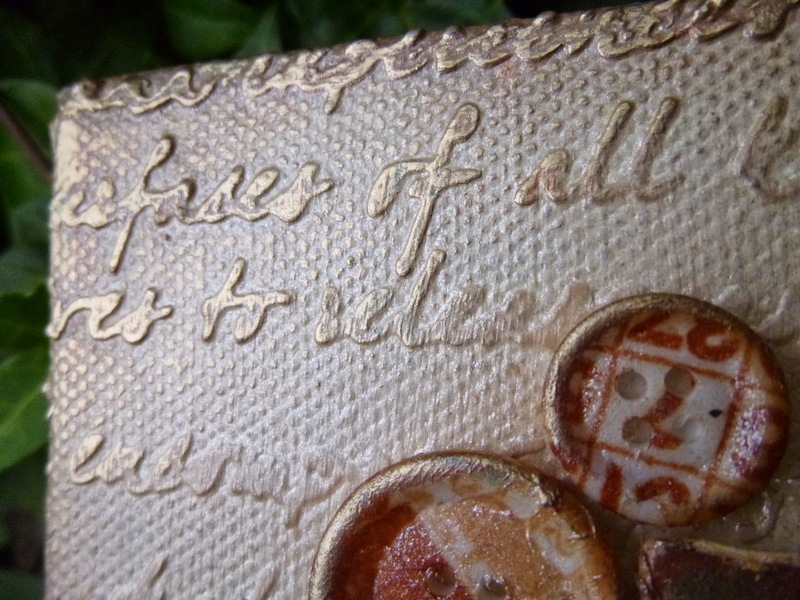 Wonderful canvas Alison, love the buttons, it all looks fab! Can't wait to give it a go!! Wow! I have to try this when I get back from holiday! Beautiful! So gorgeous! I like every details. I want try this. Beautiful Alison. Just beautiful. And Hubby likes it too! 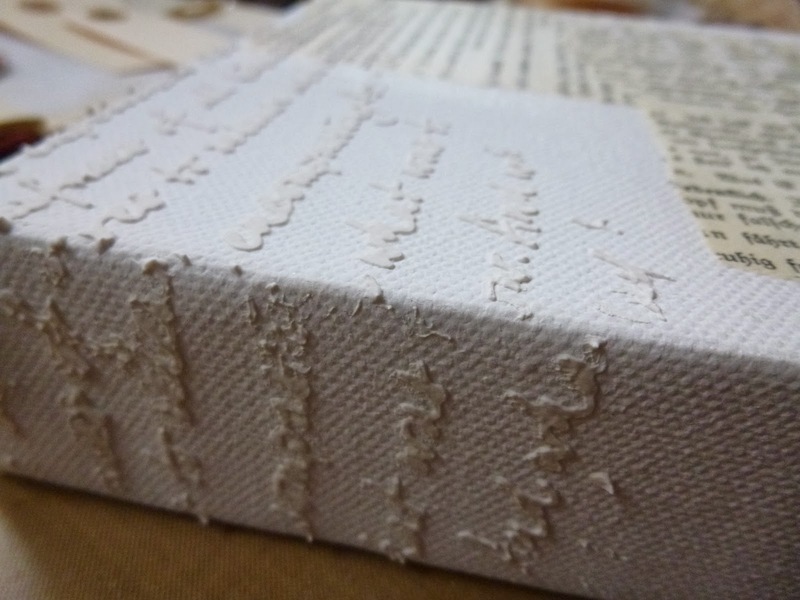 Fabulous canvas Alison! 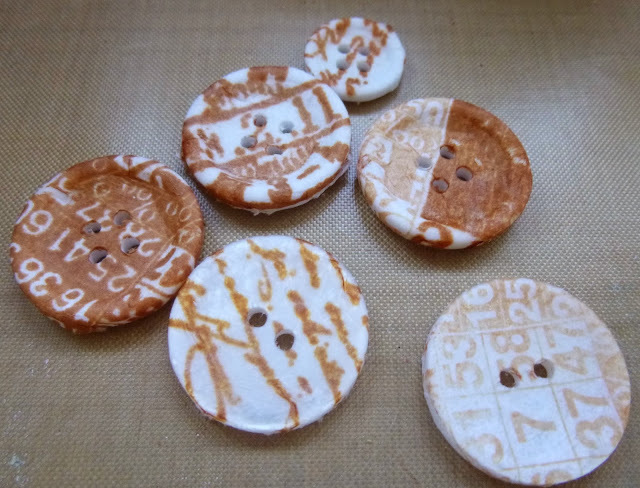 Those buttons are a great idea and I love all the neutrals! Absolutely gorgeous! 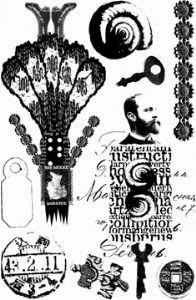 I love all the wonderful details. Thanks for such a fantastic tutorial! Oh Alison. Be still my heart! I love the design, colorations, and smallest of details. Bravo! Layers upon layers of love and light. 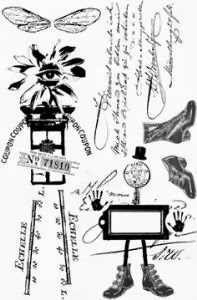 Just beautiful and a little quirky, which I love. Great art. Would you ever consider putting a link at the bottom, when you are finished, of every product you used? At least for me in the US it would show me exactly where to get the products. Just something to consider for the future. I really appreciate other DT's who do it. Have fun tomorrow! 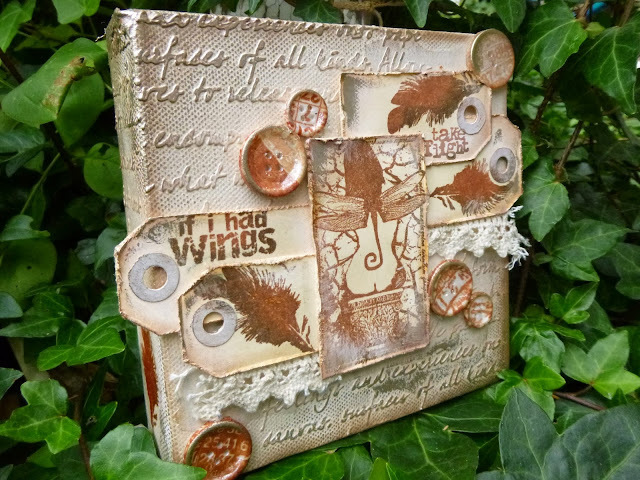 Hello dear Alison, this is THE BOMB******, oh my goodness all that brown is FABULOUSSSS, the buttons, gorgeoussss, loooooove the feathers,the background with the texture is stunning, all those tags delightful, oh my I;m in LOVE with this canvas, thanks so much for sharing your BRILLIANCE, hope you have a wonderful day and a wee bit of a rest..
Gorgeous gorgeous! 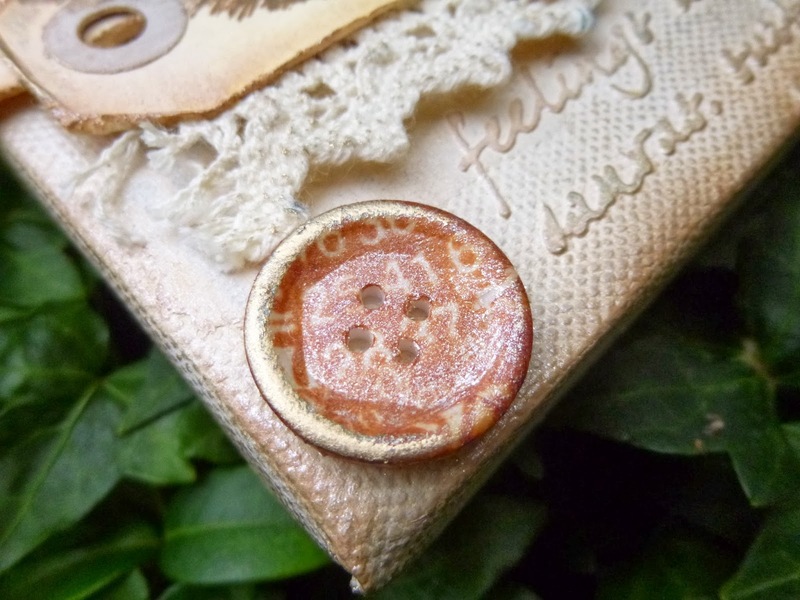 Love the covered buttons and all the layers. Fab canvas Alison and I love all those textured layers and stamps. Beautiful Alison - I don't know how in the world you think up all theses steps that turn out so beautifully. 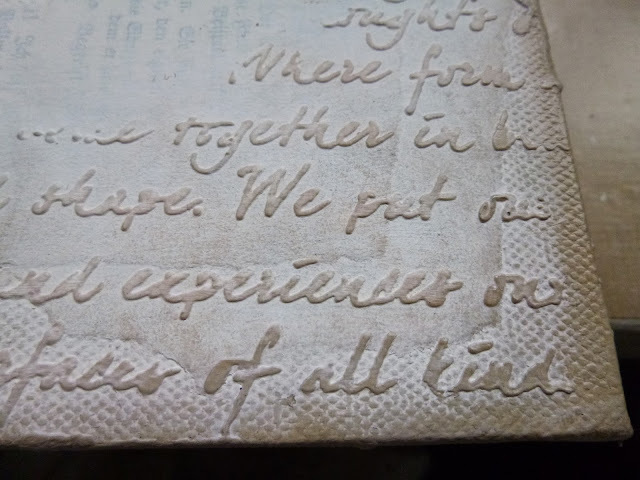 I really like the script but unfortunately Paper Artsy is out of the stencil for the time being. 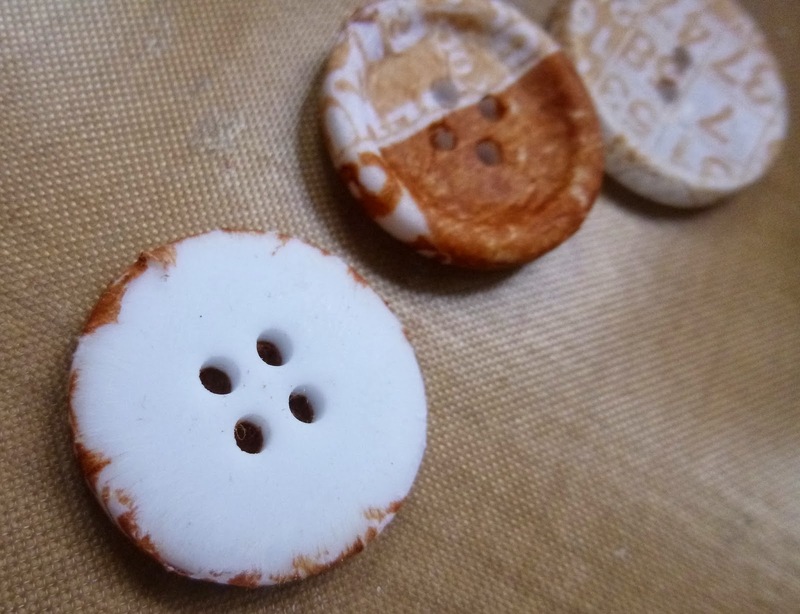 I found what you did to the buttons really a smashing idea. I think you better start touring the country side giving workshops. I know you have to get settled from your move. But do give it a thought! Love this one Alison,- your wonderful buttons - and stamps on tissue paper,-(which I love to do, too) is amazing and such great ideas... I have to try that button thing too... if that is ok ? gorgeous with the script stencil,- and the beautiful nymph stamp !! 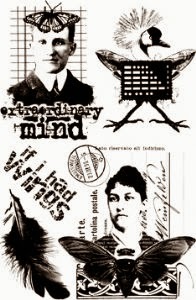 Cool project love those stamps too! WOW stunning work Alison, I love it. Beautiful use of the feather stamp, seriously this is quite gorgeous. 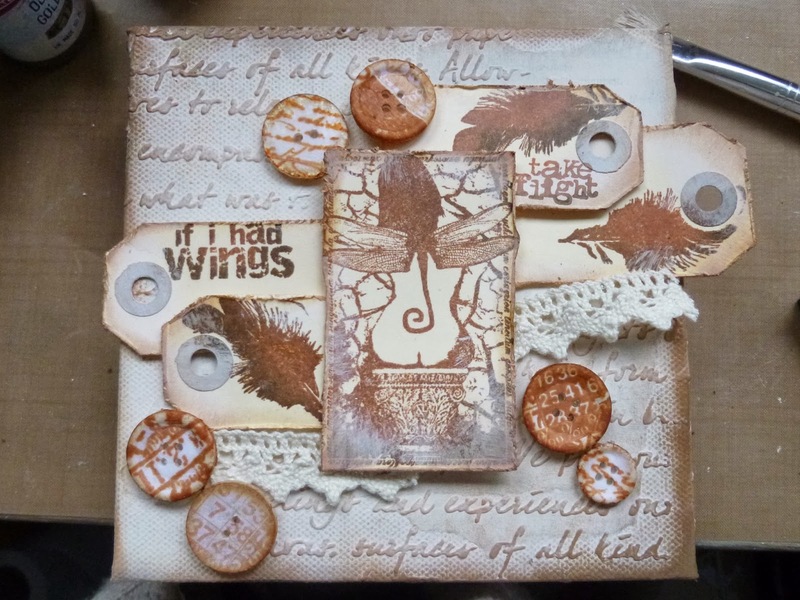 Forgot to say on your blog, love the button treatment and that feather stamp. Again, absolutely stunning. Just checked out both of your wonderful projects! Amazing work as always! !